When you’ve got a growing family, it usually means that you have a limited budget, as well. This makes smart shopping essential—but how can you pinch pennies and strive for savings when it comes to major purchases, like a new vehicle? The answer is simple: Buy your next new vehicle used. You’ll probably pay 40 to 50 percent less than what the original sticker price said—even if the vehicle you choose is just two or three years old—and you’ll likely still be getting a dependable car with plenty of life left in it. Of course, you always need to do your homework and make sure the used vehicle you select is a good one for your family, and that the place you buy it from is reputable. Below are a few quick tips for buying a used car to ensure you’re getting a good value on your used vehicle purchase. You probably don’t want to buy a vehicle that’s been through several wrecks, major makeovers, or significant flooding. So as long as you have a VIN, you can get any vehicle’s full history from Carfax, a site we highly recommend using. Of course you’ll always want to take the vehicle for a spin before you purchase—and if you don’t like how it sounds or how it feels, move on. Also make sure to inspect it thoroughly, looking for any sign that the vehicle has not been well-maintained. Look under the hood, inside, outside, and around the wheels and tires. Find any spots or scratches before you buy. Buy a certified used car. Cars that are marked in this way will sometimes come with decent guarantees or warranties, and at the very least have been inspected thoroughly to ensure that they still have plenty of juice left in them. This isn’t a promise, but certainly a good sign. Buying from a private party—such as on Craigslist— leaves you with very few consumer protections in place. It’s may be more prudent and safer to buy your vehicle from a reputable used car dealership. Read online reviews to help you select a good one. If you don’t buy from a dealer, make sure you stop by a mechanic and have them look it over during your test drive. You can get an idea of what price is fair for a used car at Kelley Blue Book. The important thing is to ensure that you’re doing business with someone you can trust, and ultimately getting a vehicle that your family can enjoy for many years to come at a good value. 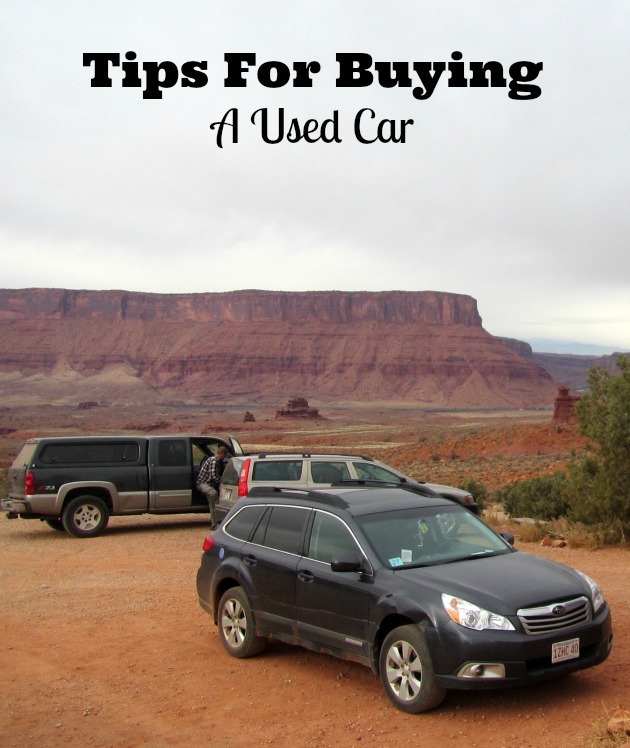 I hope you find these tips for buying a used car useful to you. My husband bought a used Ford Fusion about 8 years ago and he still loves his car. My previous car was a used Volvo station wagon and it was great for a few years but then I was starting to look at costly repairs so I moved on. Let us know how your used car buying experience goes! You may also enjoy this post on how to make the car you drive more eco-friendly! It isn’t a bad idea to try and get used cars for the family. When I was younger that is what we got. It actually was nice because we didn’t need anything expensive and it helped us appreciate the kind of car that we had. Plus, we didn’t have to worry about the kids messing them up! I need to get a car, and a used one is what I can fit in my budget right now. I really like your tip to take the car for a test drive. I would also suggest taking the kids along if you can. They can help you decide how functional the back seating is and if it will be easy for everyone to get in and out. The car might look great when it is empty, but things can change quickly when it is full of kids!